Everything you need to know about the payment methods we offer, our payment process, and managing your account. Do you accept PayPal, or bank transfer? We only offer credit, or debit card payment via our site. Unfortunately we can’t take orders over the phone either, as all of our data security is secured to work via our website. One thing we did have an amazing customer of ours suggest to another person on Facebook was she uses a prepaid Visa debit card (commonly available at Australia Post, Woolworths and Coles) to do all of her online shopping. That way she can control exactly how much she spends online without any exposure of her personal cards or accounts. Our system is set by default to allow transactions, but before any payment is completed successfully it has to be “approved” by the customers bank. When a payment fails, we’re also not usually given any details around why, because in almost all cases of a transaction not processing, it’s the cardholders bank declining the transaction rather than us. If you contact your bank, they should be able to provide a reason why this transaction isn’t being allowed. It’s no problem to cancel your subscription at any time, and it is our policy that all customers manage their account via their account page. This is to protect customers and their privacy. If you cannot remember your password, there is a reset password option as well. 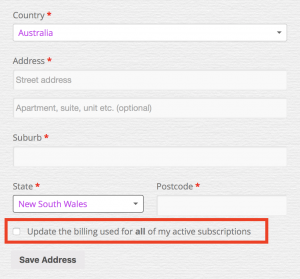 You can manage your address changes in “My Account” toggle of our website. Please ensure you change both your billing and shipping addresses as needed. Why did my subscription payment fail? As our system is actually set to accept all orders, it means that any payment fail is typically due to a customer’s bank declining it. This can sometimes happen even if there are funds on the card, but we’re not usually provided with any reason for this to have failed, as it’s not something that we have any control or visibility over. What is the $1 / $0 charge on my account? We use a highly secure payment processor called Stripe (www.stripe.com). The $1 that may appear on your statement is an “authorisation” by Stripe. They do this to check the validity of a credit card (i.e. an fraud protection measure). Something to note – it’s an “authorisation” not a “charge”, and it will automatically drop off your statement at your banks discretion, usually a few days to a week. Our system is actually set to allow all transactions, so when a payment fails for whatever reason it’s typically the cardholders bank that is declining it, rather than us. Given this, we’re not usually given any reason why, so the only thing I could suggest is to speak to your bank to find out why this transaction was declined?